An off-road bike is one of the best ways to unlock a country and discover its riches. In Laos, a small country bordered by China, Vietnam, Cambodia, Thailand and Burma, nothing could be truer… more than 80% of the country’s roads remain dirt roads. Laos is one of a few countries in SE Asia who has retained their authenticity and has become a must-see attraction in the region. Jules Classic ADVENTURE Laos offers an opportunity to discover this fascinating country on our exclusive Tours. 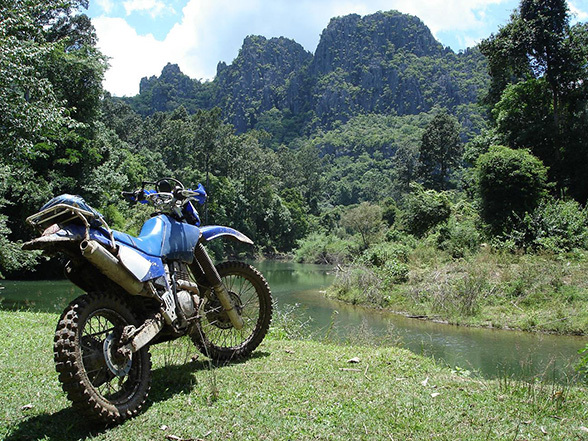 Enjoy the stunning landscape of Laos under expert guidance on reliable bikes: the Yamaha TTR250 and WR-R250 and the newest Honda CRFL250. You will experience unforgettable moments in the company of the Laotian people, known for their kindness and hospitality; characteristics still treasured and preserved in its authenticity among Laos 150 different ethnicities. The variety of trails available is nothing less than incredible. From the Mekong Valley to the mountains in the North, passing through the Plain of Jars, the Sanctuary of Elephants in Sayaboury and of course, the mythical Ho Chi Minh trails in the South. Tropical forests, river crossings either through ford or on a boat, stays with remote villages far from the tourist circuit and tunnel trails through a bamboo forest will be part of your every day. Not to mention the ancient royal capital of Luang Prabang, the Angkor-era temples of Champasak.